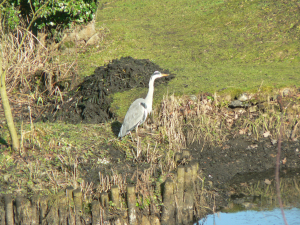 Observation - Heron visiting our pond - UK and Ireland. Description: Unlike most birds a heron will stand stock-still for a photo. This arrived soon after we had had our pond dredged so there was plenty of exposed mud with some frogs around, which we have seen them eat, though with some difficulty. Unlike most birds a heron will stand stock-still for a photo. This arrived soon after we had had our pond dredged so there was plenty of exposed mud with some frogs around, which we have seen them eat, though with some difficulty.